*Regular nightly rate is $229. Weekly rate is stay for 7, pay for 6. Your reservation total will include a cleaning fee and bed tax in addition to the rental rate. Warm, Stylish Contemporary Home on 2.5 Acres of Stunning Redwood Grove, with Babbling Creek and Waterfalls, Hot Tub; Short Drive to Duncans Mills, River Beaches, Coast. WIFI. Keyless Entry. Your Well-Behaved Dog is Welcome! The kitchen has a dining area, and is adjacent to the living room by way of an entry area. Off the kitchen, there's a half bath. Above the kitchen, there's a TV loft with desk set, reached by interior ladder as well as by an exterior staircase. Off the living room, there's one small bedroom and a full bath. Stairs from the living room lead up to a master bedroom with its own small deck. The dining area and living room open to a wrap-around deck with outdoor dining, hot tub and grounds to explore. House is approximately 1300sf. "You will not be disappointed at all! " You will not be disappointed at all! Bring food and drink, and plan on settling in to try out all the little 'cozy spots' everywhere. We had a very relaxing stay! Awesome place! Great location close to redwoods and beaches. The cabin and property are so amazing that one day we chose not go anywhere else so we could just enjoy being there. We have been coming to Cazadero for years and this has to be our favorite house we’ve stayed in. We literally didn’t have to leave for the entire trip. The kids explored in the backyard while we sipped coffee or cocktails from the deck. Evenings were spent under the stars in the hot tub or relaxing by the fire while playing board games. And the house has a stellar cd collection, to boot. Thanks for sharing your space with us, we can’t wait to come back. Wonderful quiet place in the redwoods with cool furniture and an excellent CD collection. Perfect for relaxing. "We had a great stay..."
We had a great stay and enjoyed everything about this place! Loved being surrounded by nature and made good use of the hot tub, outdoor fire pit, and the trail leading up to the first hammock. The trail is very steep, but with the help of the rope it wasn’t too much of a challenge to get up and down for an able-bodied person. The 2nd hammock looked too worn and not safe, but other than that everything met or exceeded our expectations. Loved the fresh flowers that were put all around the place right before we arrived. Would recommend and stay here again! "We had so much fun over Spring Break"
We had so much fun over Spring Break at the Secret Garden with our 4 and 6 yo daughters. The home was situated in a serene and tranquil Redwood forest. The creek created some waterfalls that gave this home a very unique feel. We made good use of the hot tub under the Redwoods, fire pit for roasting marshmallows, and the outdoors BBQ. The interior of the home was so surprisingly clean! 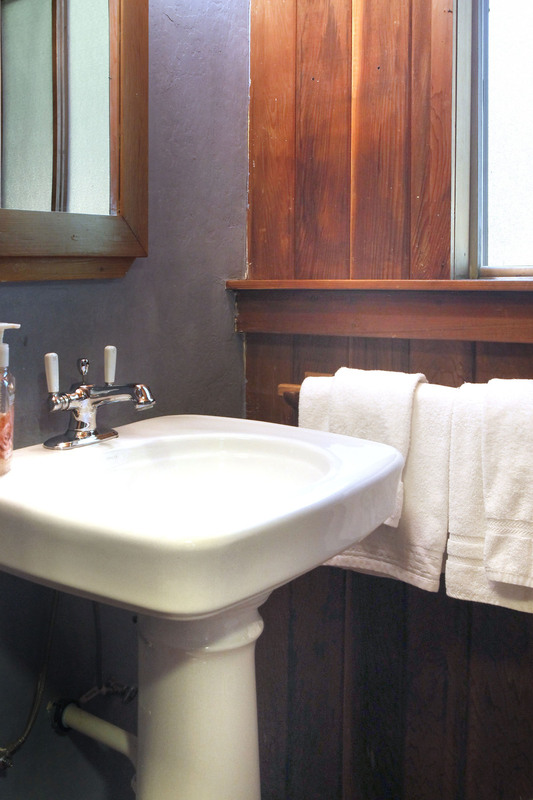 We've stayed in several country homes through Airbnb over the years, and sometimes, the owners of those homes had a hard time maintaining cleanliness. But this was not at all the case. Everything was immaculate. We're looking to return again sometime soon! "Great, quiet retreat from the city"
Great, quiet retreat from the city. The stream running through the back is lovely and there's a nice little path up to some hidden treasures! Our family really enjoyed our stay and would go back in a heartbeat! A fantastic stay! A little escape and all was spectacular! Beautiful home with romantic details. 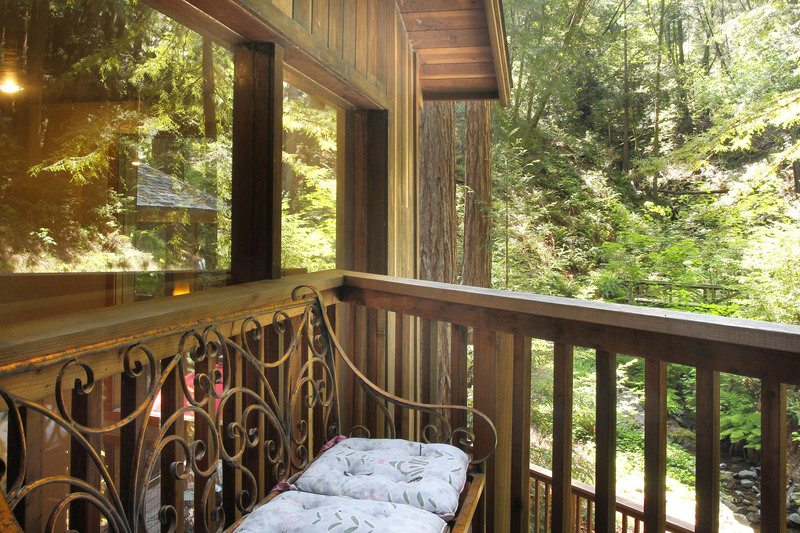 Falling asleep to the river at our window, waking up to spectacular views of the redwoods, relaxing in the hot tub or playing games on the outdoor patio, we had an amazing time! Thank you for the best getaway! A return is a must! "The redwoods and babbling brook..."
We spent 4 wonderful days in the mostly rainy weather at this beautiful little cabin in the woods. The deck and forest view were even better than we expected. Even in the rain it was a magical area. There are houses to the front of it but nothing looks out in that direction and we felt as if we were in our own private slice of the rain forest. The hosts had left bouquets of flowers that were beyond what I could ever expect in a vacation rental. The house was very clean and comfortable for us and we enjoyed our days there and hope to return someday soon. 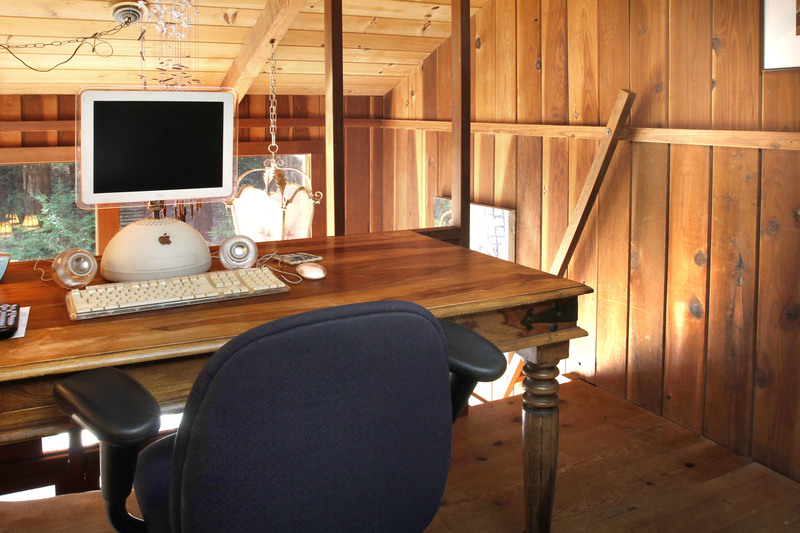 "Charming cabin in the redwoods"
Charming cabin in the redwoods, just a short drive to the beach. Even better that it is dog friendly! Host made check in easy and we arrived to fresh flowers and the wood stove burning. Great outdoor amenities -- fire pit, hot tub, trails, and access to the coast made for a fantastic weekend getaway! "This may be my favorite rental ever!!! " This may be my favorite rental ever!!! 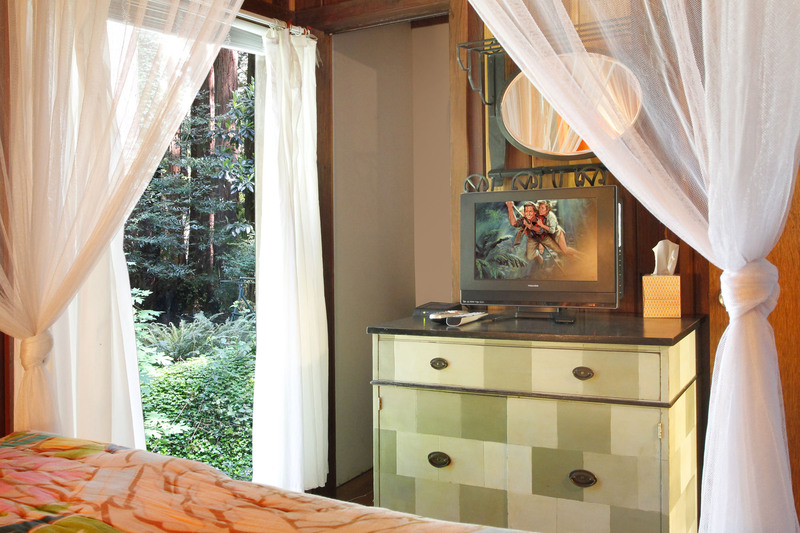 Tucked sweetly in the redwoods, with lush, beautiful forrest outside and cozy comfort inside! 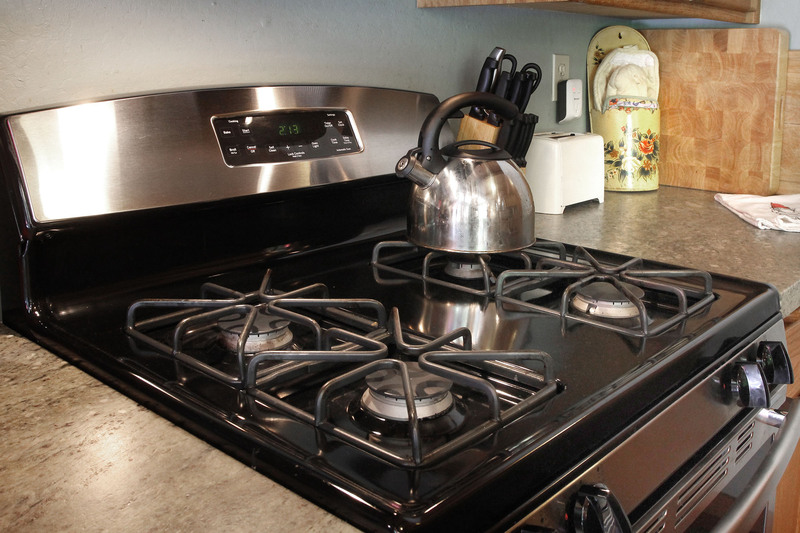 The kitchen is well stocked, main beds comfortable, whole house beautifully decorated and clean, and complete with a wood fire stove to hang out around in the living room. We had a magical women’s weekend here, and I can’t wait to return! Also — a short drive to a beautiful coastal hike at goat’s rock — or the other direction to sweet little towns in the Russian river. And the hosts were gracious and communicative! Super grateful to have found it! Our stay at Secret Garden exceeded our expectations in every way. We were in some serious need of some winding down time from the busy hustle and bustle of our daily lives and this stay left us feeling totally refreshed and invigorated. The location of the cabin is absolutely magical. Mornings were spent sipping coffee, breathing in the pure scent of the mossy redwoods, and watching the hummingbirds and chipmunks play as the babbling creek serenaded us. (Kind of cheesy, but so true!) Evenings were enjoyed on the deck with a glass of Russian River wine or decompressing in the hot tub. Exploring the property and the different trails with our 1 year old son and dog was really fun too. 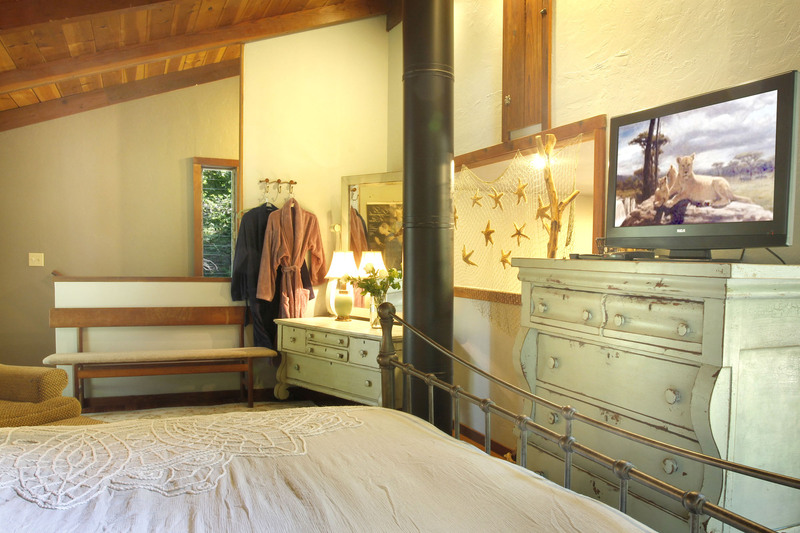 The cabin offers complete serenity. There are a few neighbors, but the position of the house/deck/jacuzzi make you feel like you are the only ones around for miles. Pictures truly doesn't do it justice. The home was very clean, had sweet touches like fresh flowers in all the rooms, had a funky eclectic design sense that we appreciated, an exceptional music collection, and some cool architecture that really gave it a "cabin" feel. 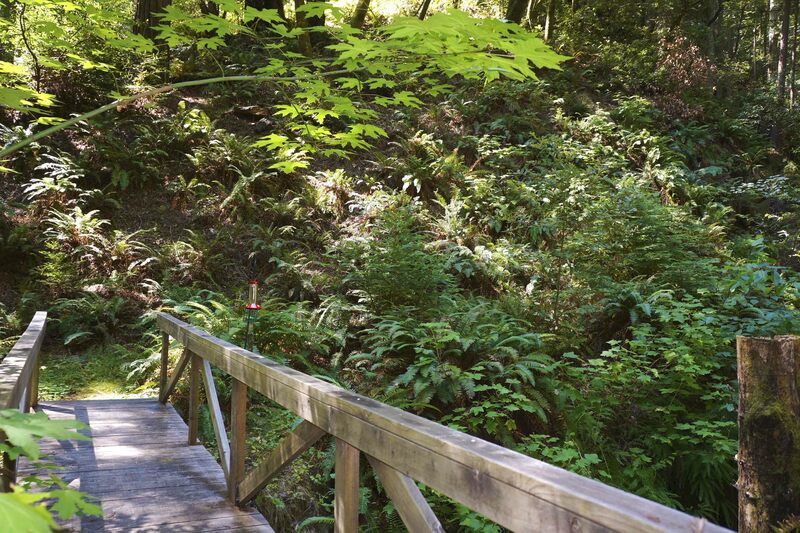 The location of the home in Cazadero is the perfect if you want to enjoy Russian River beaches, vineyards, or the coastal beaches and Bodega Bay. The fact that it is dog friendly was a huge plus. Other pluses: spacious, well stocked kitchen, easy keyless entry. "We had such a lovely stay at the Secret Garden"
We had such a lovely stay at the Secret Garden. They had a fire going in the wood burning stove for us when we arrived. The cabin was nestled between two little creeks so the sound of running water filled the cabin! So peaceful. It was close to the coast and to Monte Rio and Guernville. It is one of our favorite cabins in the area! We will be back. "This is a little gem amongst majestic trees"
This is a little gem amongst majestic trees. If you love the forest and relaxing, this is the place for you! We loved the house, and hugely appreciated the blazing fire and a few interior lights on when we arrived, given the dark and the temperature! The photos don't do it justice. The space is lovely and well maintained. What a great escape into the redwoods! Thank you! "This home was a fabulous place..."
This home was a fabulous place to spend a weekend away. We greatly enjoyed the home and grounds. We would love to return to this special home. "This is a spectacular property!" This is a spectacular property! We really enjoyed our stay among the redwoods and just wish we could have stayed longer. The hot tub location is wondrous and the space so restful. The amenities were great and we would highly recommend this place! 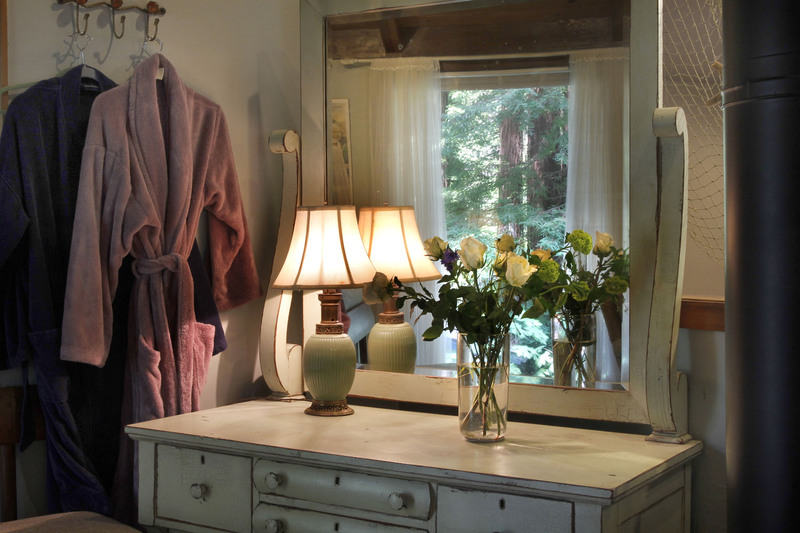 We loved the cabin during our retreat to the Russian River Valley. We slept really well on the beds, it was very cozy, and nestled right in the redwoods. It looked a bit more up-to-date in the listing, but for a rustic cabin with amenities like WiFi and a hot tub, it definitely did the trick. Cell phones don't work very well in the area so WiFi helped a lot for reaching people and searching for restaurants, etc. All in all, a great trip. Loved the creek flowing through the property, and the fresh flowers in each room were a wonderful touch. Great place for a romantic getaway! Unreal!!! 5 of 5 Simply amazing in every way, we will be back!!! Truly a lovely spot to rest your mind, body, and spirit. Rejuvinate under the canopy of trees with the soft sound of the babbling water or find a spot to sit in the many options both outside and within the home. I would've loved sitting in the sweet spot overlooking the home and creek, but the chairs looked like they'd fall apart; perhaps a new set are in order. Bed & linens were a treat as were the mostly alive flowers that greeted us. I really felt rushed to make the 11am departure though and suggest on being a bit more flexible with either an earlier check-in or later check-out. The kitchen was fun to cook in but the pots, pans and knives could all use updating. Overall the space and home were an excellent choice and I hope to return when the low season begins. "This place is so magical..."
This place is so magical and was perfect for our long weekend "Glamping" trip to the Russian River. Very dog friendly! Our pooch was so excited to explore every corner of the property and just play play play outdoors. Fresh flowers in all the rooms for us was a very sweet and a thoughtful touch. Checkin was very easy and there's a thick house rules binder that has all the answers to anything you might come across during your stay at the house. "Had a great time at Secret Garden! " Had a great time at Secret Garden! The land around the house is definitely part of the experience. 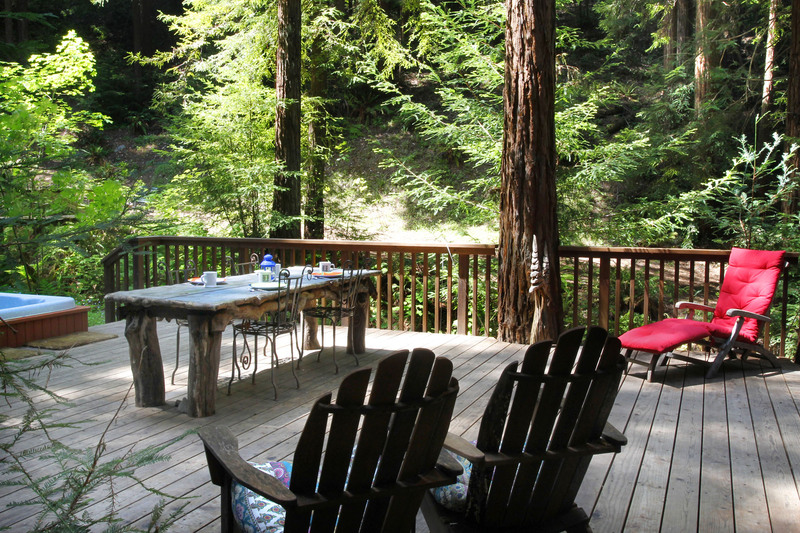 There are a few small trails behind the house, a fire pit, a creek running right next to the house to explore with a small bridge, redwoods, lots of outdoor deck chairs in fun places and a hot tub beneath the redwoods. Two creeks converge next the house, one was dry but the other had plenty of water, even in July. This place is very dog friendly, the doggie loved running around the property and the hosts were nice enough to offer towels, sheets and a dog bed to use. Austin creek located across the highway was perfect for our small dog (or a family with a small child) to play in, the water was slow moving and the depth was no more than a foot or two. To access Austin creek, there is a tiny trail between two houses directly across the street. The house had great windows with a view of the redwoods, games, cd's and a karaoke machine. The furniture was a bit dated but was fine since I covered the couches with sheets per the owners request for anyone with a dog that might jump up on furniture. There is a wood burning fireplace that the husband enjoyed and he never stopped poking the fire. Also, there is a fire pit out back where we had fun making s'mores and drinking wine around. If you are staying in the area, try out the Korbel deli for lunch, it was a pleasant surprise how awesome the sandwiches were (married to a chef), Armstrong Redwood State Natural Reserve (dogs allowed on paved trails only but worth it), note that Raymonds bakery, which is well known in the area for pizza and live music, is currently open only from 5-9 on Fridays, and to lock up your belongings when in Guerneville because there seems to be a lot of addicts roaming around. The area definitely has it own brand of charm and we had a fun experience and we would return! "Perfect pleace enjoy with family"
Is a great place, nice house, clean,quiet my kids enjoyed. they were so happy they liked it that place we want come back again thanks a lot for let us stay at your sweet home? "We loved the close and easy river access"
We loved the close and easy river access. Fresh flowers were left for us was a very nice touch. The kitchen which was well equipped. The master suite was lovely and comfortable. On the down side the bed in the second bedroom was not very comfortable and the TV loft was difficult to access. "This is an incredibly magical place to stay"
This is an incredibly magical place to stay. The house itself is beautiful and comfortable and the back deck and back yard are filled with beautiful nature, including a creek, bridge, hills to climb and so many amazing redwood trees. Can't recommend staying here highly enough. "We had a lovely time at Secret Garden"
We had a lovely time at Secret Garden. Everything was well thought out and as described. The home is gorgeous and the setting is beautiful. Very private and quiet. There are some homes nearby and it's not far from the road, but it was still so peaceful. Listening to the creek as we drifted off to sleep was a nice respite from city life. The location is great, easy access to Guernville or the coast. Thanks River Getaways and the owners for creating such a nice space. We hope to return one day. Great secluded retreat. Loved spending time here. "This was a perfect place for a city getaway! " This was a perfect place for a city getaway! 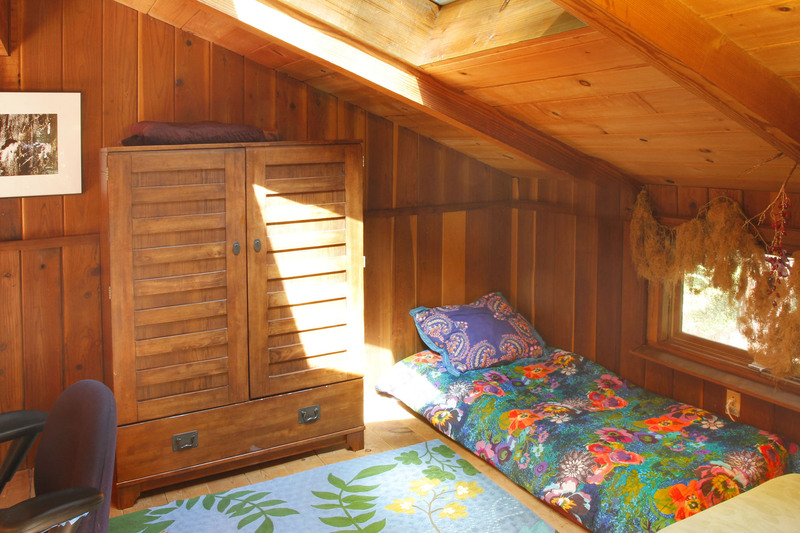 The inside is quirky and sweet with lots of great sleeping nooks. The outside deck is fantastic with the ambiance of the creek. 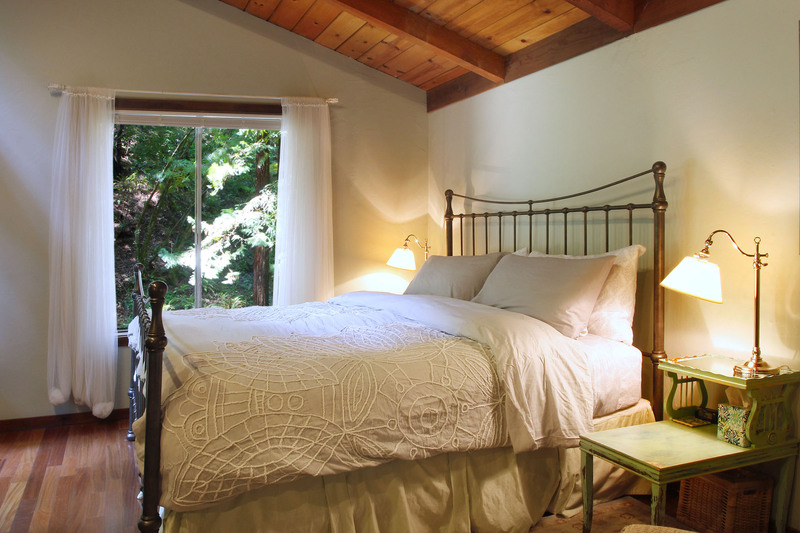 Between its secluded location, its large windows overlooking the redwood forest, its babbling brook which can always be heard from the master bedroom, this home may be the most relaxing home I've ever stayed in. I look forward to returning, hopefully sooner than later. Absolutely beautiful home in an incredible location. Perfect for a couple on a romantic getaway. For a larger group (there were four of us), the only complaint was with the second bedroom. The master room was very comfortable, but the second bedroom's bed was HORRIBLE. None of us could get a good night sleep there - the mattress is sunken in the middle and so uncomfortable. They need to replace that mattress asap. Otherwise, everything else was wonderful. Beautiful home! We were so pleased with our stay here at Secret Garden. We have to say this place is the most magical nature spot in Northern Cal. The amenities were as explained in the summary. In deed this property is a great place to relax. The bedding in both bedrooms were soft and comfy. The kitchen has everything you need even spices and condiments. 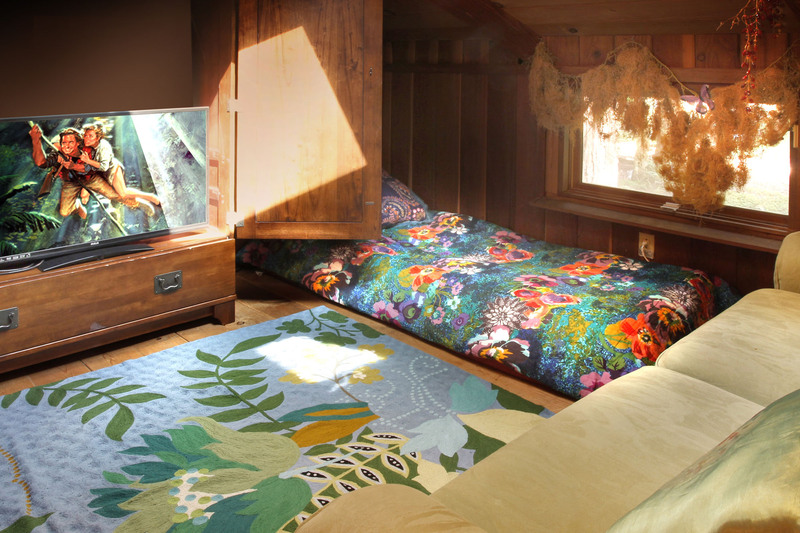 The cabin has a modern & past artsy touch with beautiful colored rugs and furniture. We can say one word of the back of the cabin "magical" It is surrounded with nature red trees and ferns. The bridge adds a romantic touch over the nature spring running down by the side of the cabin. We slept wonderful with the sound of the nature springs. The Loft is a neat place to hang out, perfect to watch a movie.The patio has a beautiful deck with hot tub and great BBQ for cooking.This is what the doctor ordered to enjoy a spot with all you need surrounded by nature stress free. Great sound set up and collection of music. We enjoyed David Bowie's collection. Thank you!! for the fresh flowers on the tables they added a smile to our stay. We loved everything in the cabin. "Great stay at the secret garden"
Great stay at the secret garden. Perfect home base for a beautiful biking weekend. 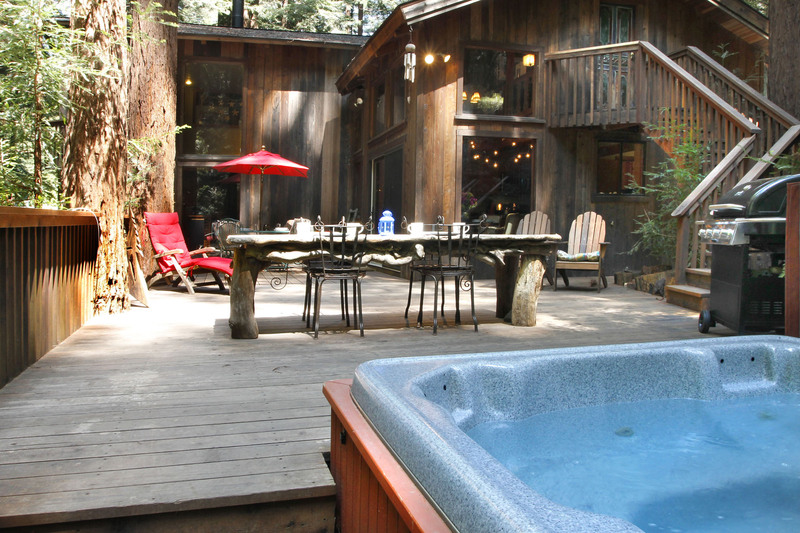 Amazing hot tub, back deck, surrounded by trees. Comfortable beds and nice sized kitchen to cook meals. We would love to come again! This house was amazing! 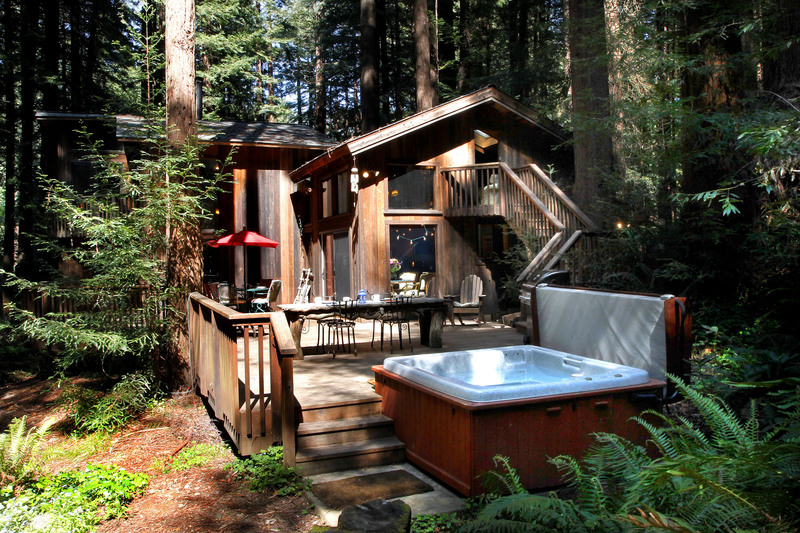 We booked the weekend there for my birthday and had so much fun - the hot tub is super nice and the backyard opens up into the redwoods. There's also a cute creek that flows down from the hill behind the house so you can hear flowing water all day. There were plenty of cooking materials which was super helpful. Though it would have been nice for the grill to get a bit hotter. One thing to keep in mind is that they have a two car maximum policy (even though there is plenty of parking) - we had to play quite a bit of musical chairs as my friends all came up in separate cars (because, you know, life). We had to stash the cars down the road but it wasn't too bad, just an extra step in planning. Also - two of the bedrooms do not have full enclosures. So if you want true privacy take the bedroom downstairs. "Everything was as expected and more"
Everything was as expected and more. The place was clean when we got there, the beds were surprisingly comfy, and the scenery was perfect. It's a nice quiet spot where you can just hangout and enjoy each others time. Did not get cell service out there, but there was wifi when needed to lookup places. Would definitely come back to vacation here. The cabin is cute. The location is amazing. It exceeded my expectations. I highly recommend. Thank you so much for staying with us here on Russian River. 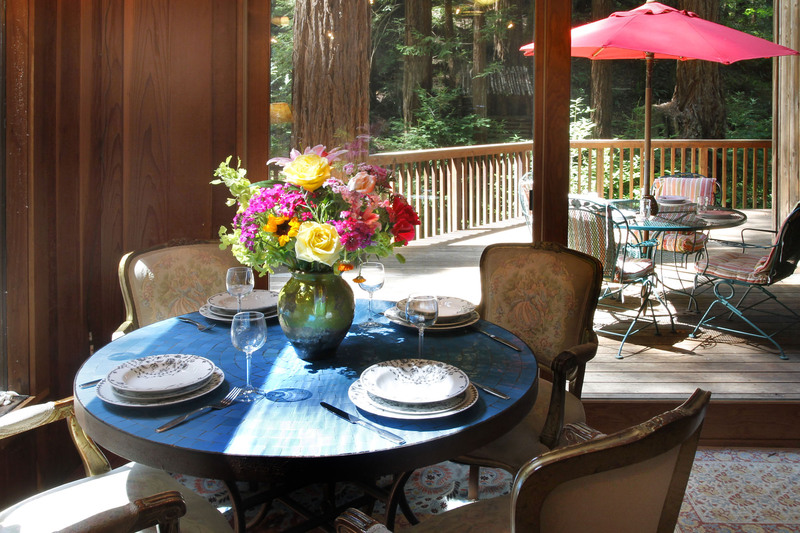 Secret Garden is a special home to come to for a wonder relaxing stay under the redwoods. We are so happy that you enjoyed the stream that flows through the property down to Austin Creek. You were all wonderful guests. We would welcome you back to Secret Garden or to any of our other homes again, when you need another visit to Sonoma. Russian River wine country is always a good idea. "Wonderful haven in the redwoods..."
Wonderful haven in the redwoods far enough from road to make it feel secluded with the creek raging beside providing an amazing lullaby soundtrack Layout is interesting No bathroom in upstairs main bedroom Amazing wood burning stove that kept us cozy and warm Well appointed kitchen We will rent again! 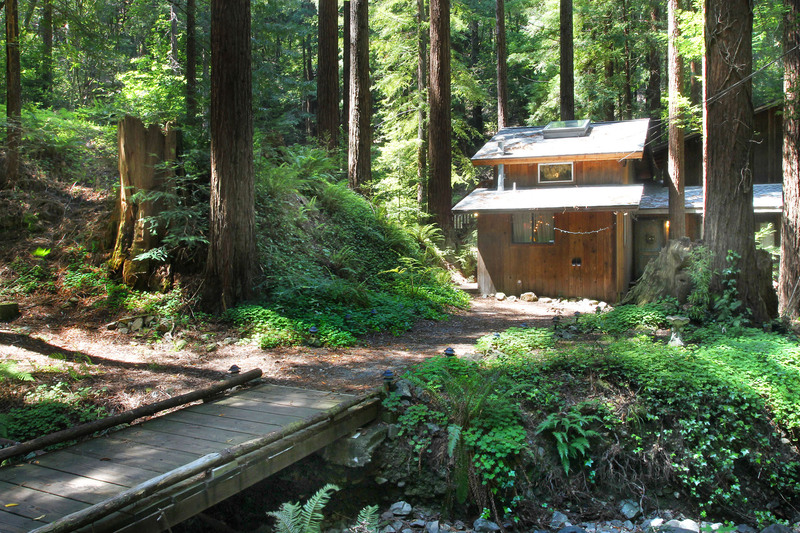 5 miles from nowhere, but just an incredible home in the redwoods. Relaxing, comfortable, great for doggies. Thank you!! The house was wonderful. The location looking out on a little waterfall with a babbling stream running next to the house was so charming. The kitchen was well stocked with pots, pans and other utensils which made cooking easy and stress free. The little things like doggy sheets to throw over the furniture and the well stocked wood pile were really appreciated. Being 10 minutes from Goat Rock Beach was the best. We will definitely be a repeat renter of this special getaway. "Peaceful, remote location in the Redwoods"
We rented this home for Thanksgiving, and enjoyed cooking our feast for two. The home was clean, the kitchen was well stocked, plenty of cookware, dishes, utensils and dishtowels. The view out the windows in the kitchen were lovely and peaceful. We even enjoyed holiday lights in the kitchen and bouquets of roses in several rooms. A very nice welcome. There is a good sized stream running across the back of the property and we loved falling asleep to the sound of it.The upstairs master bedroom is large and has a sitting area. The bed was very firm and comfortable and there were plenty of blankets. There is a TV in the room.The room downstairs was small and has a very uncomfortable bed, so we didn't use the room. There is a TV in the room.The bathrooms were both downstairs and well stocked. One of two sinks in the main bathroom off the living room was stopped up so we didn't use it. Shower was great; the main bathroom was roomy and functional.There is a wood burning stove in the living room that we used for heat. Wood is provided. There are wall heaters too. There is no TV in the living room, this was disappointing for Game Day.There is a loft above the kitchen that can be accessed using an attached vertical wood ladder in the kitchen or by using stairs outside on the deck. It was cold and rainy outside while we were there so we used the ladder. There is a TV, desk and sofa bed that was fairly comfortable in the loft. Heat rises, so it was too warm for us. We opened the small window up there to cool it down. Also, difficult to take any drinks or snacks because of the ladder. If you had to use the bathroom, you had to go down the ladder. 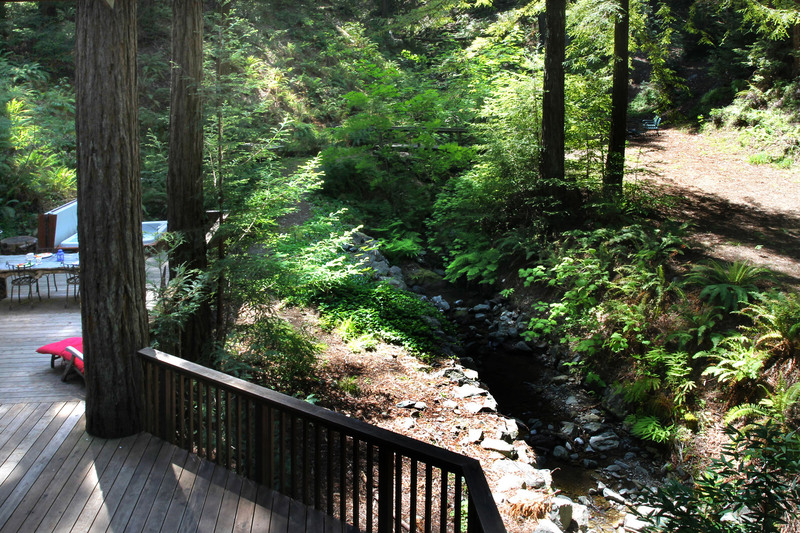 There are large decks on the back of the house that provide a beautiful view of the stream and redwoods. We didn't have a chance to try the Jacuzzi.We would recommend this home to others, and might go back for a visit to try a different season. "Had a great stay deep in the woods!" Had a great stay deep in the woods! Lots of space, including a huge deck. Can easily sleep two couples, with plenty of room for another person or two. Bring some groceries and grill up a nice dinner. "October was the right time." We have stayed at Secret Garden before, but it has always been in the summer and the area can be quite busy. This time we came in October, and it was perfect. No vacation crowds, the weather was great and we even got a little rain. Which was ok, because we live in the desert, so it was a welcome site. The house was in great shape as always. The outdoor grill worked great. Actually used the hot tub this time, nice. We brought our three little dogs with us and they were in heaven with the creek area in the back. Can't wait to return. Thank you for a great vacation. The only thing I would recommend to the owner, would be to put in some under counter lighting in the kitchen. It's very dark. "The house was pure magic"
The house was pure magic and absolutely amazing, nestled among the redwoods. There is so much to explore on the property from the creek to the many chill zones around the house and yard. With so much nearby (stores, activities) this was the perfect location away from the hustle and bustle while still only 5 min away from all the amenities. I'll be back for sure. "This is a truly special cabin"
This is a truly special cabin, and we had a great time enjoying the peace and tranquility that it has to offer. We will definitely be returning more frequently. "Great house with a huge deck..."
Great house with a huge deck and outdoor space with lots of quirky areas to sit and chill. Probably not the right fit if you have accessibility issues (due to stairs) but that wasn't a problem for us. We were all up and down the Mountainside just across the creek from the house with the dogs who loved it. "The Secret Garden was truly a wonderful place to visit"
The Secret Garden was truly a wonderful place to visit. The cabin was tucked in the back of a short driveway, with some neighbors in close proximity to the front door. The back deck area was spacious and private, with only one neighbor in sight. The barbecue was stocked with propane and ready to roll (which we took full advantage of.) The hot tub was ready to use as well, but I was made nervous because I couldn't seem to turn off one of the blowers for the tub (faulty electronics?). The house was set up and stocked as described, with only some minor discrepancies that our party took care of for the next. (Citronella candle was burned out, Dish Soap was almost empty.) There is no TV at all in the main room, rather there is a small TV in the attached room and a bigger TV in the loft. The door for the first floor bedroom opens abruptly into the dresser which caused some frustration with one of our guests. Overall, we were very pleased with our visit but it's obvious that the owners don't visit the property in between guests to make sure everything is stocked accordingly. "Such a wonderful cabin in the woods"
Such a wonderful cabin in the woods. Perfect for two couples or a couple and two kids. The house was tucked away from the road which we liked and there is plenty of space behind the house to explore. The hot tube, grill and creek running by the house are all really nice extras. "Had an absolutely wonderful time "
Had an absolutely wonderful time at the Secret Garden cabin. Beautiful setting in lush green forest, creek running right by the cabin, great amenities (grill, hot tub, etc...) Would definitely come back. "Great Getaway under the Big Trees"
Four of us stayed at Secret Garden recently and fell in love with the location. The setting is tranquil, the rushing flow of water down the hill, just outside the windows kept us company every day. The interior is clean and more than adequate for a quick trip, but there were a few things that kept the rating lower than excellent. Wireless Internet was very sporadic, the hot water took forever to reach the shower, the downstairs bedroom is very small; not a deal-breaker for us, but the bed itself was uncomfortable. We would definitely consider returning despite these issues, just for the surroundings - simply breathtaking! This was our second visit to this home, which is cozily nestled along a creek. It has all of the amenities that one would need and is quite comfortable to stay in. This was our second time to stay at Secret Garden, and it seems like it just gets better and better. Such a little piece of heaven in the middle of the redwoods. So peaceful and quiet, it's like the rest of the world just doesn't exist when you're there. I highly recommend this beautiful, tranquil little piece of heaven to anyone wanting to get away from all the craziness of the city, and just simply relax. Enjoy this charmimg location, full of wonderful amenities, in the best and easiest location, just a short drive from San Francisco. Trust me, we'll be back again and again, as I know you will to, once you've stayed in my "little piece of heaven". "Already Want to Come Back, We Kept Wanting to Extend Our Stay"
Stayed Here with my Husband, little sister, and our German Shepherd Layla 5 Nights in September. We took a road trip from Palm Desert, we needed a changed of scenery. We usually go to Costa Rica, Kauai, or Mexico...this time wanted to switch it up to include our dog. The house is very warm and inviting. Everything was very clean, almost anything you needed to cook the perfect meal was there. The first day there it rained all day, we found ourselves playing board games and enjoying the hot tub. The property is absolutely amazing. The creek, the waterfall, the bridges....everything was so perfect. We extended our stay an extra night, tried to do it another night but sadly they were booked. Next time we come out here, we'll be utilizing the kitchen more for sure. I posted pictures to my Facebook and Instagram, I instantly had 5 people asking where and how to book. Very lovely and special place, great job with this property! "Beautiful Forrest Setting with lots of birds and cute critters." Not sure what I can add to the other positive reviews posted already. The fresh flowers (in the Kitchen, in the Living Room and upstairs in the Bedroom) were a really nice touch. Very thoughtful and much appreciated. The WI-FI system worked well, which is a good thing, considering there are no land lines and no cell service (at least for AT&amp;T). I used Skype for the few calls I had to make. The home was spotless upon arrival and we tried to leave it in the same condition. Great selection of CDs provided; again, much appreciated. If you like birds and chipmunks, by all means consider bringing a bag or two of birdseed. The Jays, chickadees and occasional crows will all appreciate it and entertain at the same time.A couple of suggestions for improvement:a. The kitchen is too dark; the lights really should be replaced by something brighter. (Cooking in a dark environment can be a challenge.)b. The AV system is needlessly complicated; I personally would replace the entire set-up.c. I would place a label at the bottom of the grill asking folks to shut off the gas at the propane bottle as I think the grill may be leaking a small amount of propane. We had a great time and please don't interpret my suggestions for improvement as intending to dissuade in any form or fashion. The place is great and I would stay there again without hesitation. "Breathtaking and Serene a true escape .. that feels like home"
Arrived to fresh flowers and fire going in stove it was a beautiful welcoming home.I enjoy cooking and the kitchen was well stocked and had spices which delighted me as I had brought some from home . The only items missing were cookie sheet ,pie plate, bread pan .A food processor and kitchen aid mixer would have been great but truthfully I am one of the few that probably use kitchen that much and I still managed to make bread ,pie etc so I was happy.The Jacuzzi was wonderful ,sitting out there on the deck felt like you were alone in a forest. I fell asleep each night to the sound of babbling the brook.I had issues with karoke/cd player and I notified management and they had someone there in an hour with cd player. I usually spend vacations out of the country in places like Mexico,Fiji the Dominican Republic and all inclusive resorts. This by far has been the most restorative and enjoyable vacation. Went hiking in Armstrong Redwoods park down to Bodego Bay for great crab cakes at Spud point Crab Co truly absolutely delightful place to stay. "lovely home surrounded by gorgeous forest"
We had a great stay at secret garden and will definitely return. Thanks you to the owner for your effort and thoughtfulness. The lit fire, warmed home, fresh cut flowers and twinkling Christmas tree upon arrival marked the beginning of a truly magical holiday. Thank you.Russian River Getaways ..smooth, pleasant and a feeling of complete security in planning. Thanks Mike!!! (and others). Everything was great,the outdoors, the house itself. Instructions provided for everything, which is very helpful. The only thing I, personally, do not understand is that why there is a $100 cleaning fee,if it is expected from tenants to clean everything up after themselves what is the point? Other then that, everything was awesome! 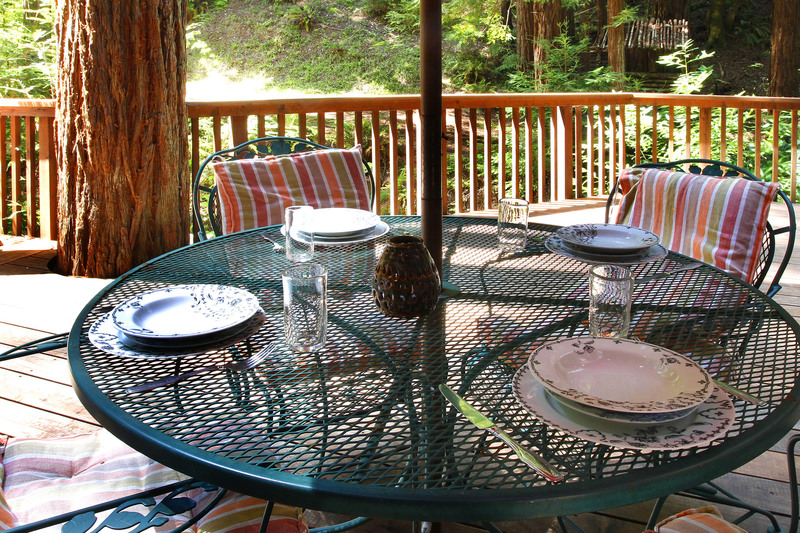 House in the redwoods--beautiful location in the woods; huge deck, updated kitchen and amenities. Good shower, no bathtub, but hot tub on the deck; can look up and see the stars at night. When you drive up, there are several houses near the front of the house, but the back and the deck feel completely private. There is a creek and the property extends into the woods. We had a wonderful stay here and would definitely return. What an amazing time we had staying with our two young kids, age 6 and 8, at The Secret Garden. I can't even begin to describe how magical the back garden truly is. The house itself was lovely with very quality decor and an incredibly comfortable master bed. The only tricky part about the cabin was the sleeping set up. It worked for us as we had just two adults and two little kids who are still small and willing enough to share the second bed. The other sleeping area is the loft which is a little precarious to access (and especially difficult to come down), especially for small kids who might have to get up in the night to use the bathroom. We have rented from Russian River Getaways in the past and have always tried to rent at different locations. The Secret Garden is high on my list to return to. Loved the location with the relaxing deck and hot tub. We had a BBQ every night (3 nights). We would sit and enjoy the sounds of the stream running through the property while enjoying a glass of wine. Our 17 year old loved sleeping in the loft..she felt it was her own little apt with a separate entrance.Thank you for sharing your home with us! "Secret Garden is a Gem"
Loved the backyard! Huge deck with gorgeous views of the creek. The backyard makes you feel like you have your own private wonderland. We had a perfect 4 day getaway. Relaxing in the hot tub, Bbqing on the deck, making s'mores on the outside fire pit or hanging out in the creek, we had a great family trip. Kids loved the loft and board games. Very dog friendly.Only minus is neighbors are closer than expected, we were afraid to do Karaoke late at night because the neighbors are close enough to hear it. Also we arrived on a Thursday evening and on Saturday while we were out at the creek, someone stopped by and came into the house to place flowers. Which the neighbor kindly informed us when we were walking back from the creek "That someone was looking for us, in a white truck and was knocking on the door". It was very nice to leave flowers but left me uncomfortable that someone came into the house while we were not there. "The gem of the redwood forest!" This has to be the gem of the redwood forest! My husband and son and I spent Christmas 2012 there and it will be one of our best Christmases ever! The house was so inviting. We really felt like the owners had prepared it for our arrival with a real Christmas tree, a fire in the stove, and live flowers on every table! It was amazing. It rained most of the time we were there, but it was fine because we were happy to stay in the house. We have never slept so well, thanks to the comfortable beds and the beautiful sound of the water in the creek. We hope to be back one day. Fire was lit when we arrived, with water trickling in the creek, and fresh flowers on the table. Great, cozy bedding and everything we needed in the kitchen. Amazing touches to make us feel welcome to this great retreat! Our kids (4 and 2 years old) loved the property, and were expert trail-blazers by the end. Short drive for coffee and pastries at the Cazadero bakery, and skip, hop and jump to the beach and amazing coastal scenery! Pure bliss! 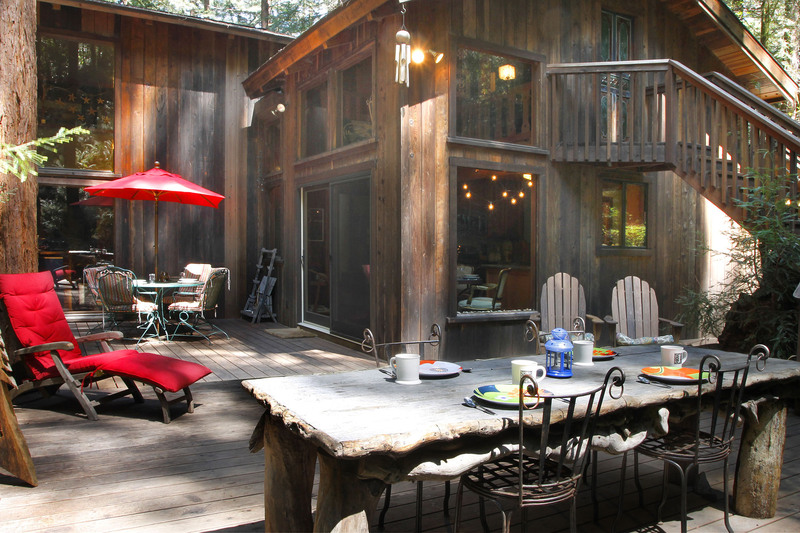 "Beautiful secluded retreat, yet so close to many interesting things to see and do"
A well appointed house, surrounded by redwoods, with a babbling brook and a private deck and hot tub. The directions and instructions were very clear. Fresh flowers welcomed us. Everything worked well. We spent a relaxing week. Each day we were able to visit surrounding attractions within a 15 to 45 minute drive, including the Pacific Coast, a number of Sonoma wineries, the Northwood golf course, and an antique fair. Groceries are readily at hand in Cazadero or Guerneville. We have only one suggestion - it is time for new pillows on the master bed. Otherwise, we had a great time. We would recommend Secret Graden without hesitation. 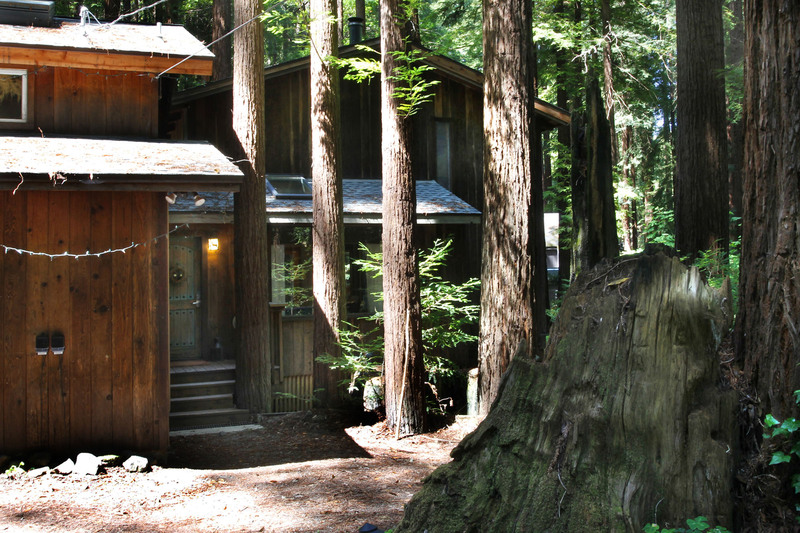 "Enchanted House in the redwoods"
Secret Garden is an amazing hideaway in the redwoods!!! My Mom recently came to the bay area to visit and my sister and I took her to stay at the Secret Garden. It was soon easy to see why this special place is so named. each of us had a wonderful time exploring and making good use of the outside retreats enchanted by the sound of the stream and the birds. Thank you for such a lovely retreat for us to enjoy together. Can't say enough about this spot. Nice burbling stream out back that you can hear in the very confy master bedroom. Great backyard, which makes for quite a bit of privacy in your stay. The back deck is really the focal point of the entire house. Faces a redwood-laden hillside. Very pretty setting. Easy access to austin Creek across the street. Don't know how you can't be relaxed in this place. "Secret Garden is the perfect name for this perfect place!" This cottage is the "diamond in the rough" woods. Upon driving up Cazadera Highway, we wondered what our vacation destination would hold, and we were very surprised and pleased with the prize, Secret Garden. The house was immaculate, well stock and organized, and beautiful! The beds were very comfortable and the bedding of high quality. But the garden was the best part! 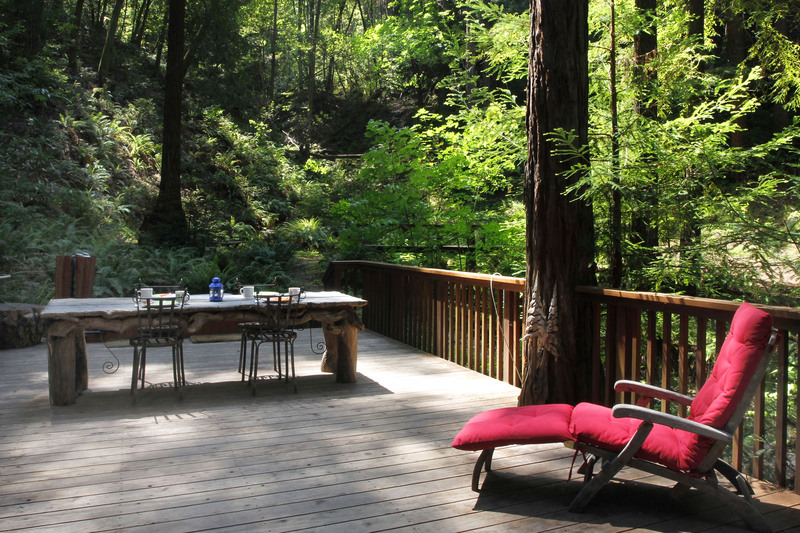 The lush greenery, towering Redwoods, and soothing sounds of the flowing creek, which ran right through the property, were so relaxing and transforming I wanted to stay forever. I regret writing such a positive review because then the "secret" of Secret Garden will be known to all. We loved our stay at the Secret Garden. It was a "tad" pricey for only 2 nights, but well worth it. There was a minor set-back as we had no water for most of our first full day,(which we didn't find out until we got there and found a note on the counter) but we made the best of it and went downtown to eat and explore. I wish we had stayed one more day to fully experience the property. We had a great time, the waterfall right outside is amazing and the master bedroom has the most comfortable bed! We will hopefully be coming back soon! We're saving our pennies! 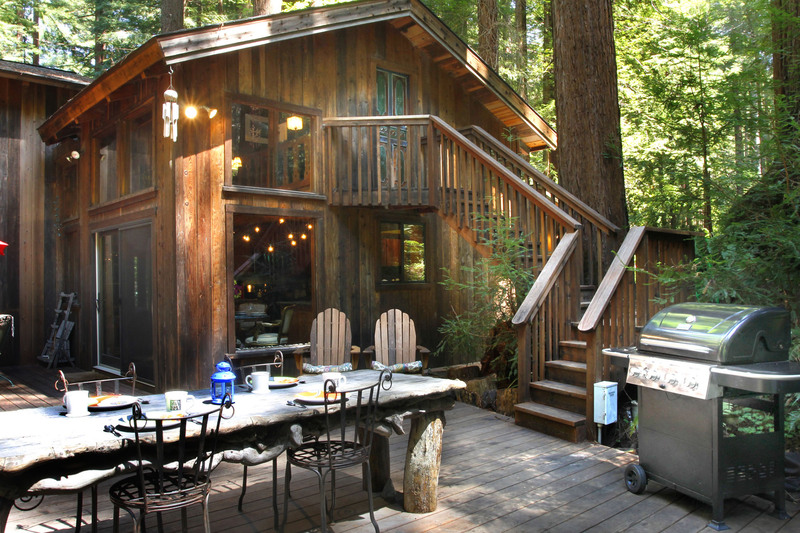 This cabin is nestled in the redwoods between two creeks with a Master bedroom view of a cascading stream. This was a cozy stay for our family. Even though it was rainy most of the time, that was just fine for us. Aside from a day trip to nearby armstrong Redwoods, we were content to sleep in, enjoy reading by the wood stove, soaking in the hot tub and taking walks in the rain. It's near enough to wineries that we made a day trip to several wineries as well. This cabin has everything you need and everything you didn't know you needed. Very comfortable. Beautiful surroundings. I definitely will be back! First off, making the reservations were easy. The assistance we received was very thorough as well as helpful.Our stay at the Secret Gardens was a great experience. Our daughter, who was on break from college, enjoyed herself and discribe it as " So relaxing and stress free ".Our two Lab dogs were in Heaven from the life of the big city of San Francisco. They loved the surroundings and peace that Secret Gardens provided.My wife and I loved it just as much, if not more!!! The location was 20 minutes from town where we enjoyed shopping and a night out for dinner. Perfect!All amenities were available for inside needs.We are so looking forward to retuning in the near future. Craig and family. "2 Hawaiians In The Woods"
Aloha, spending three days in the Russian River area was exactly what my wife and I needed. The stay at Secret Garden made it all the more special. The convenience of the keyless entry, the location, the directions given (to get to the house as well as all the info on how to operate things in the house), the amenities, etc. was all very welcome and helped with peace of mind. The ample supply of firewood, the jacuzzi, and the great serenity was a huge plus. Loved the sound system. The ease to get around and especially to the wineries was awesome. We had a great time there. I suppose the only complaints was the downstairs bed, we found it uncomfortable (too soft for our liking). But the upstairs one was very comfy. Would be nice to have a bathroom upstairs in the master bedroom, but not a big deal. The only other thing was the proximity of the other houses, from the pictures it was difficult to see how close neighbors are. Definitely weren't a bother, but just a little less private than we were imagining. All in all, loved it. "Comfort and beauty all in one." Very easy to find using directions provided by Rrgetaways. When we arrived the fresh flowers in the dining and living room was a nice touch. The hammocks are quite a hike up a steep hill, but definately worth the climb. The views were amazing! There were sheets and towels for our dog in the bathroom (nice addition). The climb via ladder into the loft is extremely steep, but the kids loved it anyway. The creek added a nice pleasant peaceful feeling all day and night. Definately a place you should rent! "Secret Garden lived up to the reviews and photos." Secret Garden did not disappoint. We were welcomed by fresh flowers, a very nice touch. The house was fantastic both inside and out. The hot tub was a nice way to relax after a busy day of touring. There was only one problem and that was with the BBQ. Only one of the burners lit up making cooking very difficult. I'm sure it is a simple fix and will be addressed for the next vacationer. My only other suggestion is to make the directions on how to run itunes through the stereo clearer. Secret Garden is a lovely spot and I will be returning with my husband in the near future. "Most awesome property on the planet"
Secret Garden was a most delightful piece of heaven. We can't imagine a more beautiful location. Everything was clean, and the absolute high point was being met by the gorgeous just-like-at-home floral arrangements. It was quiet, even though neighbors were close-by. They weren't at all intrusive due to the layout of the house. We were extremely disappointed that both the BBQ and the large TV in the loft didn't work. Also, if the large screened TV had worked, it would make much more sense to have it downstairs rather than up in a hard to access loft. I'm not one to typically write reviews, but from the second we walked through the front door and noticed fresh flowers in both the living room and kitchen, I knew this was going to be a wonderful stay! The house was spot clean. 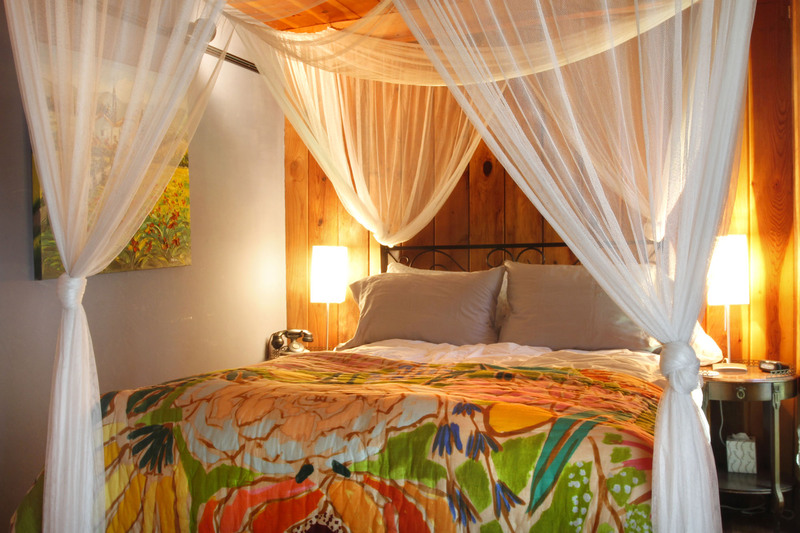 The owners have thought of every last detail to make your stay as comfortable as possible. We had gone to the grocery store before arriving, but realized we forgot coffee for the next morning. Upon returning we opened the freezer to find ground coffee waiting for us! Being able to bring our 2 year old Vizsla with us also made the trip. They provided dog beds, towels (especiallly for dogs) and just made us feel right at home. The house has a private, gorgeous deck backed right up to a tree filled hillside. There is a creek running past the house for the ultimate ambience. My wife and I are already planning our next trip back to Secret Garden and can't wait. We will be back! Beautiful home in Russian River. I could not have asked for a more zen setting. Pet friendly which was a plus. Thank you so much for sharing your beautiful home with us. We will be back. The cabin was very nice out amongst the redwoods. Very peaceful and relaxing. Nice ammenities. Really enjoyed our stay. I work at animal Care and Control in Sf-it can be real stressful-5 days at secret Garden washed all the stress away. Surroundings were beautiful but beware of false advertising. First,the kitchen does not open to the living room. You must pass through a doorway to enter the living room. Second, there is no full bath located upstairs in the master bedroom. The full bath is located off of the living room, next to the very small bedroom; the half bath is located in the kitchen. The property is not located "well of the road". Though you can only hear large vehicles pass by, you will see headlights coming through the window if you are upstairs in the loft watching TV. Most of the land associated with this house is located behind which does alllow for some hiking. The hot tub was great as was the stream that ran next to the house.Falling asleep to the sound of a running stream was certainly soothing. Being a dog freindly house was also a huge plus, though the numerous scented plug-ins made us wonder what they were trying to cover up. Though we enjoyed our stay, we will probably not return. We really take exception to being accused of "false advertising." While we appreciate getting corrections to any information we provide and we are correcting these two minor representations, we certainly never intentionally mislead anyone. This house is in fact "well off the road." Most homes in Cazadero are on Cazadero HIghway or Austin Creek Road and are subject to some road noise. This is one of the exceptional properties offering great solitude in its beautiful setting well back from the road. Most people really love this house and come back to it over and over; hard to know what these guests expected that they didn't get---a kitchen off the living room instead of a kitchen with a dining area between the kitchen and the living room? Oh well...I'm sure there is an old saying that is applicable here. "Possible last trip with my dog"
I was looking for a remote get-away to spend with my best doggy friend. Dusty is very shy of people. The house is not as private as I expected which made Dusty nervous and you can hear traffic. It does have a wonderful view and the brook sound from the upstairs bedroom is wonderful. The air freshner smell used to mask the smell from the kitchen was too strong for me so I had to remove them during my stay. The timing of my stay was unfortunate as my dog became ill (she had a tumor and needed surgery - has cancer) and I spent much of my time going to the vet. When I contacted Russian River Getaway about the problem with the heater, the initial contact person was very short. I asked if I could stay an extra two hours and even though the next people were not checking in until the next day, I was going to be charged another 20% so I declined. I probably won't use this service again as it seems rigid and given the circumstances with my dog (beyond their control of course) and the fact that the heater did not work properly the entire time I was staying there, I was disappointed there was no flexibility. The house I must say is beautiful and decorated in just my taste. Nice property and great location (unless you are looking for extreme privacy with absolutely no traffic noise). The house was very beautiful, clean, quiet and had more amenities than we expected. Huge deck w/ a BBQ and outdoor seating. There's also a campfire spot a little ways away from the house, which was cool to roast marshmallows on. There were also two hammocks up on the hillside and little waterfalls. There was also a hot tub that was awesome. The house had heating, but if you run a small fire in the stove, you really won't need to use it.The bed was incredibly comfortable and the loft was a great place to sit and watch TV. The bedroom upstairs was big with a smaller one downstairs. Kitchen was clean with plenty of dishes, pans, pots and utensils. You really don't need to bring anything, just your own food. There's a karaoke machine that has thousands of songs. The location was perfect, very private, even with the nearby houses. Loved the streams and the surrounding forest and footbridges. Everything is really green here, I'm guessing because of all of the rain fall. There's a really small general store about 4 miles away, plus Monte Rio, Guerneville and Jenner all within 20 minutes. The Russian River is a short drive away as well, where we kayaked and swam. We really didn't have much reason to leave the cabin, but there are some cool things in the area to check out. The temperature was between 70-74 while we were there.The only downside was that the hot water for the shower was hit and miss. Even with the dishwasher and nothing else running.Can't wait to come back. It was better than we expected. "Very nice get-away that allows dogs." The house was great, the property was beautiful and everything was set-up on our arrival. Our only complaint was the cleaning fee. We had extensive instructions on cleaning up after ourselves, taking out the trash, picking up after the dogs, bringing our own bedding and covering all of the furniture...which we did. However the $122 cleaning fee was much too high for a 2 night stay in which we were required to clean up after ourselves anyway. I was also surprised that we had to unmake the bed (and find somewhere to put the clean linens) in order to remake it with our own linens. Not something exciting after a long drive. This is unbelievably strange. We require only two items of "clean-up"---do your dishes and take out your trash. Why on earth these guests brought their own bed linens, we can't imagine. Of course we have rules to make sure people don't leave dog hair all over the bedding and dog poop all over the yard, but that's basic decency. Major misunderstanding as far as we can tell. "Even better than my already high expectations!" Our stay in the Secret Garden was truly unforgettable! We arrived later than we expected and of course I forgot the one page with the keyless entry code. LUCKILY, the after-hours phone line answered our call and provided it. From that point on my husband and I had an amazing time. All the high reviews are spot on!There was a fire going when we arrived and beautiful fresh flowers with stargazer lilies! (my favorite!) The following morning we woke up to see the gorgeous view from the master bedroom! Incredible! We could listen to the creek babbling even with the windows closed.You can tell just how much the owner(s) must love this home. It is gorgeous inside! All the windows are perfectly placed to enjoy the privacy of the property. 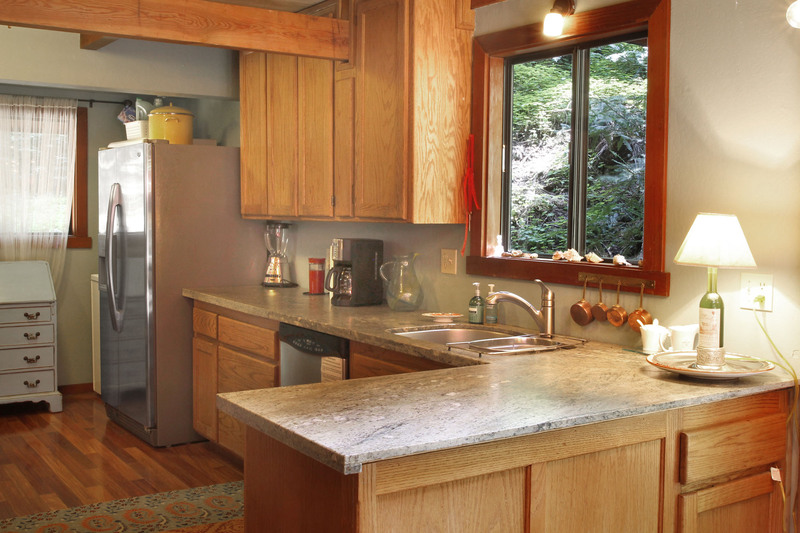 Loved the spacious kitchen, woodstove, dual headed shower, comfortable king bed in the master and LOVED the hot tub! It was sooooo amazing and we enjoyed hottubbing in the morning and evenings.The property is a lot of fun to explore and we hiked up alongside the creek and couldn't help but take tons of photos the whole way. So green and lush! I think this rental can truly be enjoyed at anytime of the year. SO with all this love I only have one suggestion. RR Getaways advertises on their website that firewood and fire starters are provided. When I made my reservation they told me twice that it was NOT provided and on the property description page it told us to purchase it at a Safeway before hand... Well we did. And when we arrived the owner graciously provided plenty of firewood and fire starters for our stay!! They even left a note saying "please enjoy the firewood for free". :) Thank you owners for all that you provided! Also, there is no cell phone reception...at all. But of course we ended up loving that after the first day. And thankfully there is free domestic long distance phone service. We can't wait to rent this home again! We highly recommend! "Truly breathtaking! Absolutely everything you need in one place"
My girlfriends and I stayed here for a getaway weekend. The property is breathtaking. I couldn't imagine a better location. We really appreciated the fresh flowers inside too. I plan to return as soon as I can. The house is beautiful, the back of the property simply amazing. 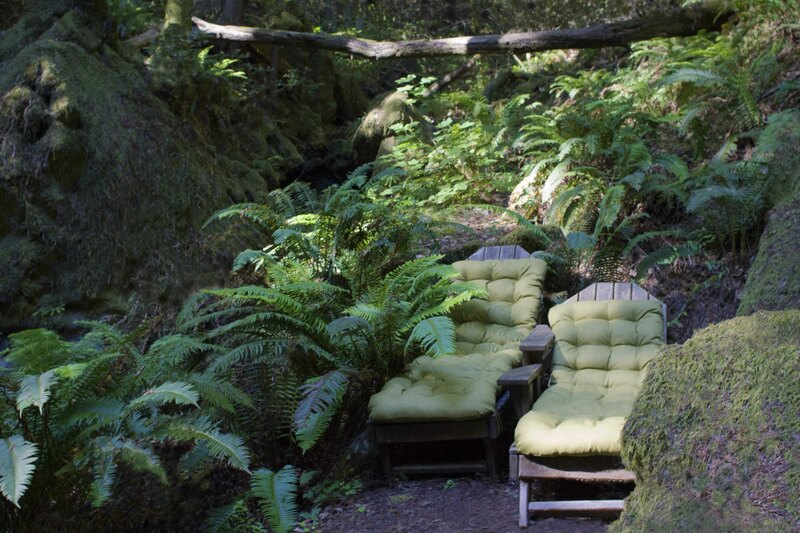 From the sun breaking through the towering redwoods in the early morning to relaxing in one of the hammocks in the afternoon to sitting in the hot tub at night listening to the babbling brook to roasting marshmallows over the fire pit, you can't beat this location if you're looking for a spot to just chill. My friends, dog and I (from 3 different states) rented Secret Garden for a girls only trip. We enjoyed the area from the local vineyards and wineries to the beaches of the Sonoma Coast. The house had almost everything we needed. It was spotless upon our arrival with fresh flowers in two rooms. After reading other Russian River property reviews, we made sure to bring extra toilet paper, but we didn't need it (and we're talking 4 women over 4 days) as the supply was fine. One missing item that was slightly annoying - tissues in the bathroom would've been nice. The half bath being attached to the kitchen was a bit odd, but it was functional. The full bathroom was large and beautiful (but the hot water was tempermental). While the house did sleep 4 adults, the downstairs bedroom was quite tight with room only for the double bed and the dresser. We didn't use the TV in that bedroom, but there was no DVD as stated. The "futon" in the loft area is really just a few cushions on the floor. The large TV there is a waste as there is really nowhere to sit except for the floor cushions. We didn't miss having a TV in the living room (we're on vacation, who wants to watch TV! ), but can see how others might. The karaoke machine was a great touch (and provided many smiles, laughs and memories). We arrived after dark which made it difficult to distinguish that the driveway was beyond the metal gate. It would be helpful to mention that in the property fact sheet. Overall, we had no complaints. Our intention was to relax and spend time with each other and this house was perfect for just that. "Lovely cabin in enchanted forest"
I am reluctant to write a review because I am afraid the cabin won't be available next time we want to go there. 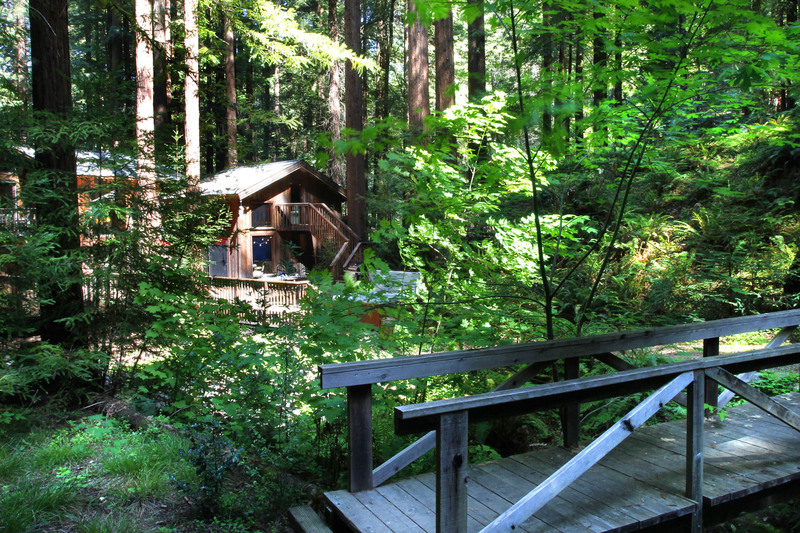 We celebrated our 30th anniversary by spending a week in this lovely redwood cabin in an enchanting setting with a bubbling brook and towering redwoods. There were beautiful fresh flowers when we arrive. The place was immaculate. It was a great home base for exploring the area- Russian River, Pacific coast, wine country, redwoods.The only cons were the shower hot water is a bit erratic and the kitche could be a bit better equiped if you like to cook a lot. These minor things were far outweighed by all fabulous things about this rental. This place is so awesome. It is like a fantasy come true (if only temporary). I am a New Englander that had to sadly relocate to southern Cali....always looking for something that reminds me of my former. 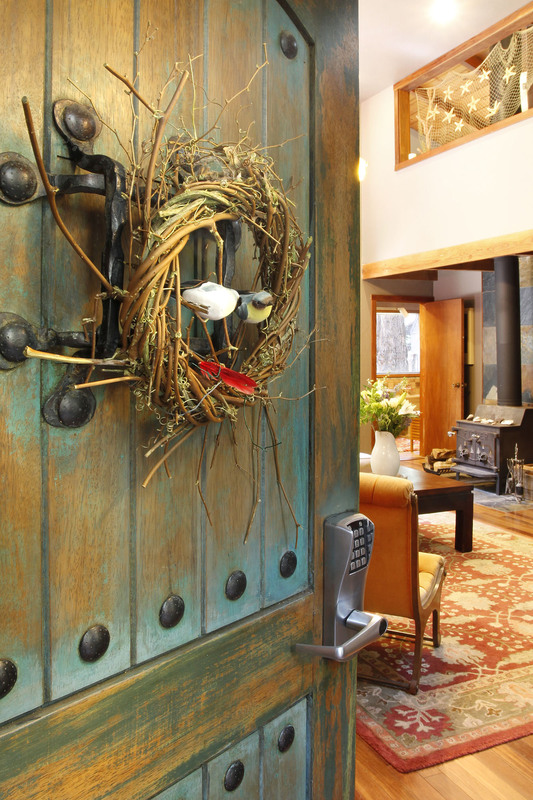 I loved the rustic home called "The Secret Garden". This home is very beautiful yet comfortable, done in very good taste. I have to credit my son for helping me to decise on a place to stay. RR Getaways has way too many lovely places to chose from. I think that he liked the loft, yeah he loved the loft. What a cool place for a teenage boy to hang out in,,,,every kid should have a place this cool (and of course loved the wide screen TV). Mom loved the master BD, antique furniture, comfortable king size bed and wonderful view. The kitchen is just perfect, gorgeous granite counter and very modern. Loved the hardwood floors and decorative rugs. 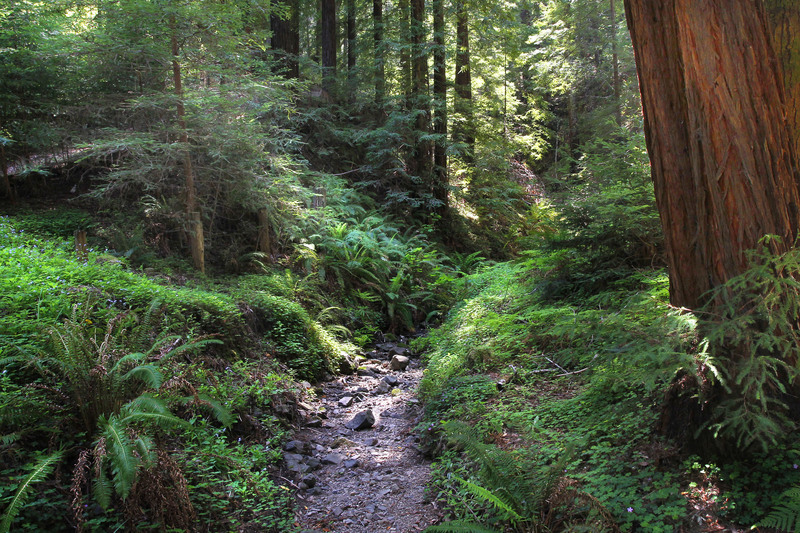 The grounds were story book, the brook and bridges and of course the wonderful redwoods. We brought our German Shepherd also (as the one shown in the photo also caught my eye). She loved it also and I very much tried to vacuum up all her hairs as we left....it is great that dogs are allowed. I also think that it is good that the company is strict about dog issues. Everything is conveniently located and I would not change a thing about Secret Garden.....I have had to think about TICKS again, as I made sure to put Advantix on the dog but should realize I needed to spray myself before hiking in the woods.So, we would very much like to return this lovely home.PS....the deck, the deck, the deck! This is such an important feature so that people can hang out and grill etc. Best kept secret in the world! "Shhh ... don't let the secret out"
This house was simply fantastic, even better than the pictures and description led us to believe. Our party of four adults thoroughly enjoyed our weekend getaway and the beauty and comfort of this house made it even more special.The pictures made us think it was a cozy cabin in the woods, but there is lots of living space and four adults would not feel cramped, even if you didn't use the expansive and lovely deck. The house is very nicely appointed, has nice plates, chairs, and a comfy couch. There's no cable tv in the main living area, which our party wouldn't have wanted anyway, but there are a couple of tvs in other places in case your idea of nice vacation is sitting around watching tv in a different house. The loft, where the biggest tv and the mac are, is up a ladder from the kitchen and might be treacherous to reach if you were not able bodied.The trees and ferns surrounding the house are beautiful, and the small brook behind the house was babbling and lovely. The house is not isolated as there are a few others next to it, but it is the furthest property up a small valley from the road. So, while you can see other houses from the road-side of this house, the property has a real sense of privacy and from the large deck, hot tub, and back of the house you're just surrounded by forest.Our only complaints were there weren't enough sharp knives, particularly a bread knife, and there's a weird 2-inch step between the kitchen area and living area which tripped up most of us for the first day or two. Be advised that there are of course mosquitoes on summer evenings, so bring repellent. "Cozy home in the redwoods!" My boyfriend and I stayed here with another couple in March and had a wonderful time. 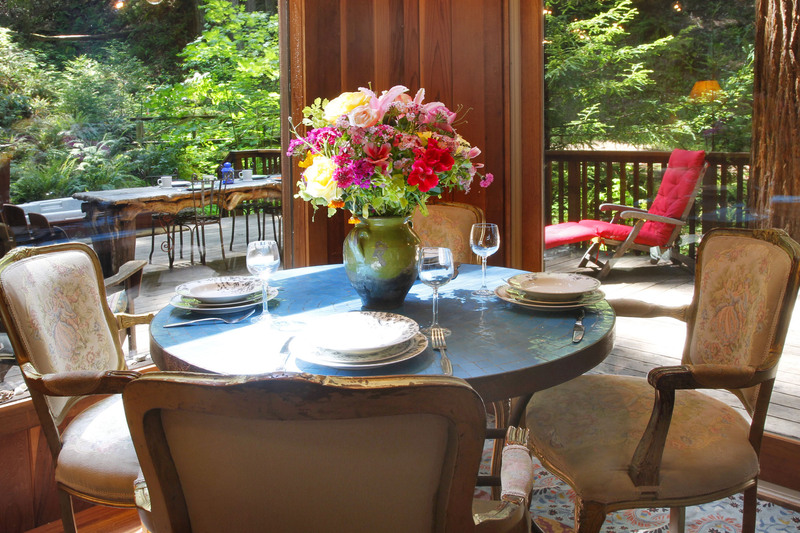 The "secret garden" home is tucked away in the redwoods off the street. it's a great place for relaxation. We cooked dinner each night, relaxed in the hot tub while listening to the nearby creek and made some cozy fires in the woodburning stove. Not only are the outside surroundings fantastic, but the interior is really cute. This is a great place in the winter and I'm sure it would be just as beautiful in the summer. We will be back again for another relaxing weekend soon! We had a wonderful time at Secret Garden. The house was beautiful, inside and out. The yard was so great, we felt like we were in the middle of a forest. The home was so clean, well decorated and and it had everything we needed in the kitchen and plenty of firewood available. Our dogs also loved the yard and the creek. There is so much to do in the area, but I was perfectly happy to stay around the house. It was very private, quiet and peaceful. I have stayed in two other vacation houses, both of them near the ocean, but this is the nicest, cleanest home we have ever stayed in. It is beautifully decorated. I would definitely like to come back again, and have recomendend this rental to my friends.